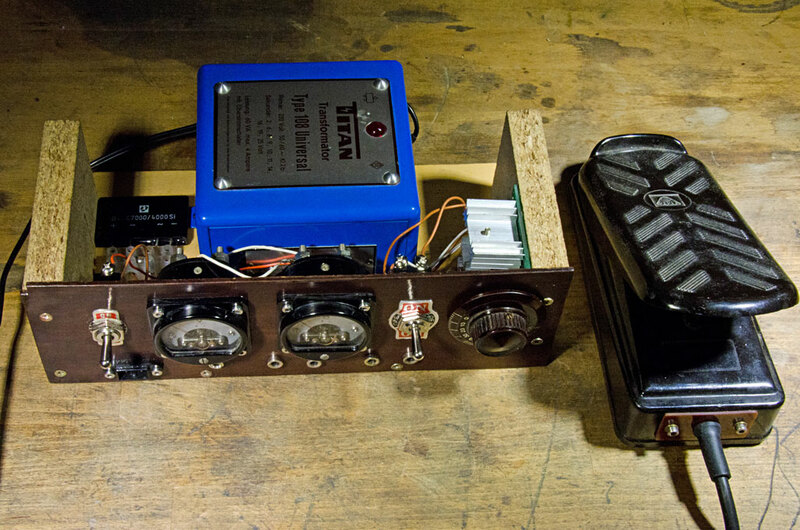 The die-filer is a machine that has all but disappeared from modern workshops. I suppose there are several reasons for this. Many consumer goods and toys that once would have been made from (folded) sheet-metal parts are now made from injection-moulded parts. 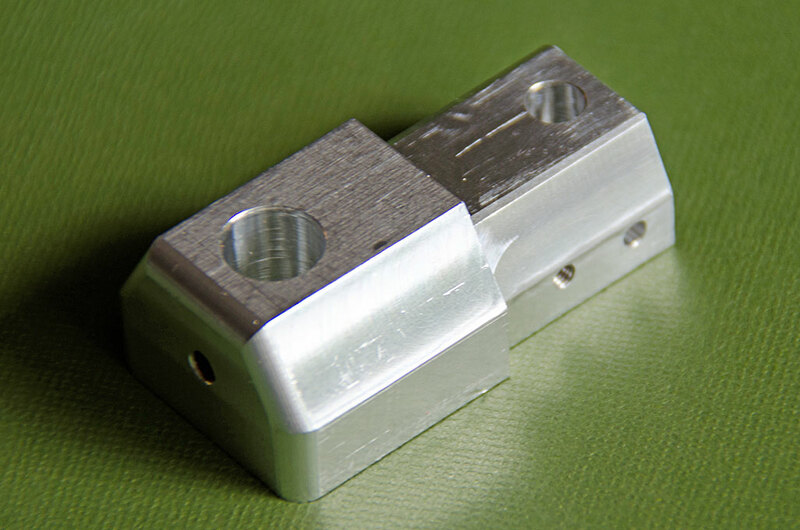 For more delicate sheet-metal parts also photo-etching is being used. I believe the watchmaking and jewelry industry still uses stamped parts. 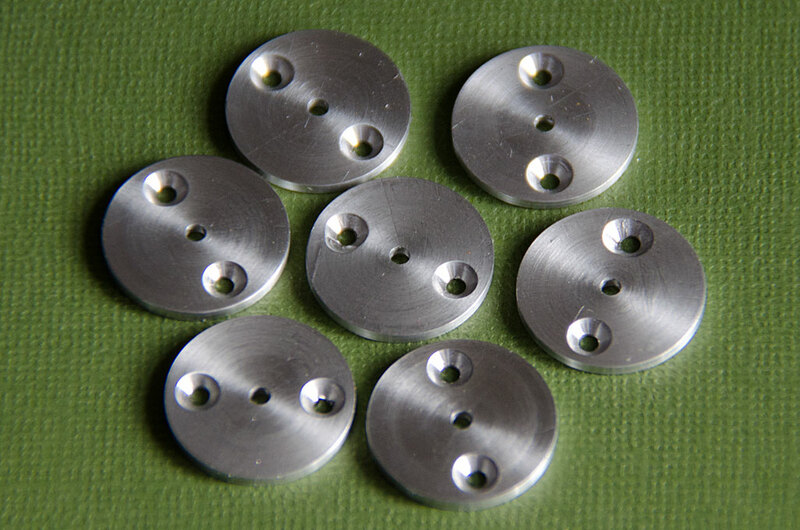 However, also the methods for making dies has changed. 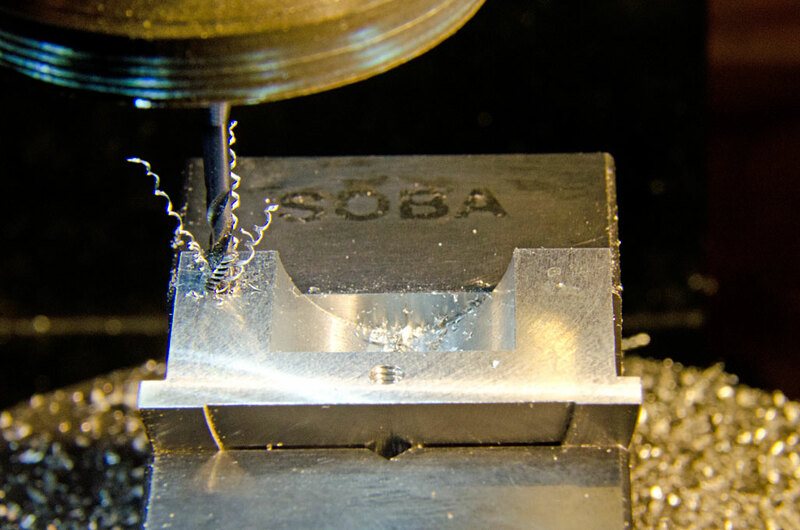 While the stamp can be worked on using milling- and grinding-machines, this is often not possible with the dies, particularly, when they have to have sharp internal corners. 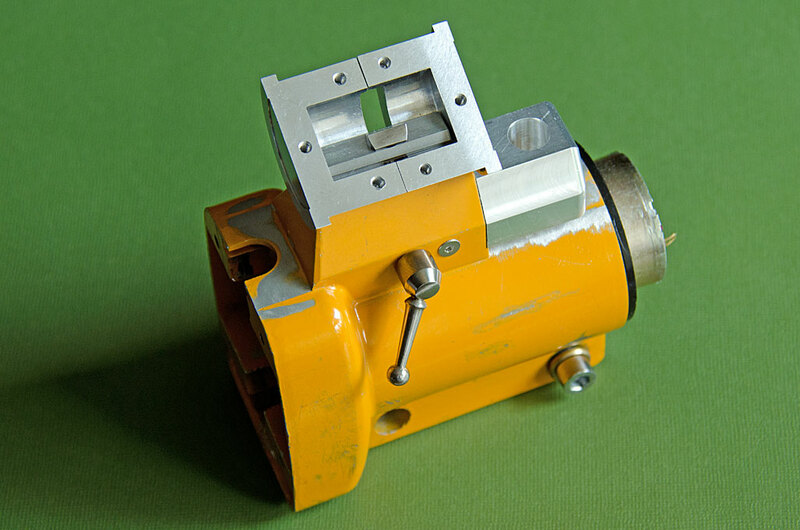 The die-filer with its reciprocal, rather than rotary, movement allowed to do this. An inclinable table was needed to work-in the relief that permitted the stamped parts to drop out of the die. 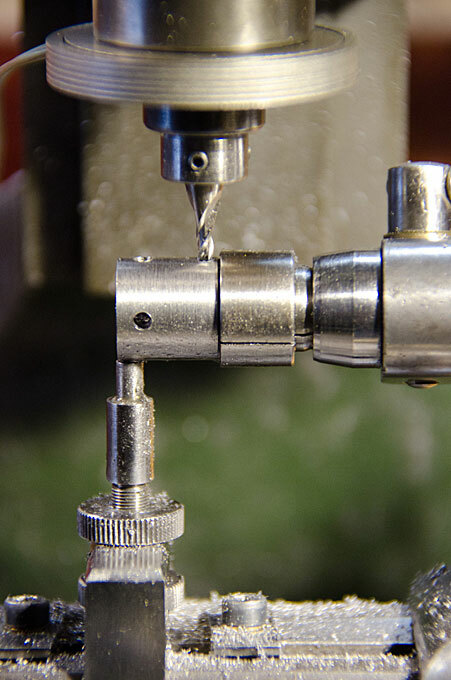 Today, electrical discharge machining (EDM) and laser erosion has replaced the old technique. 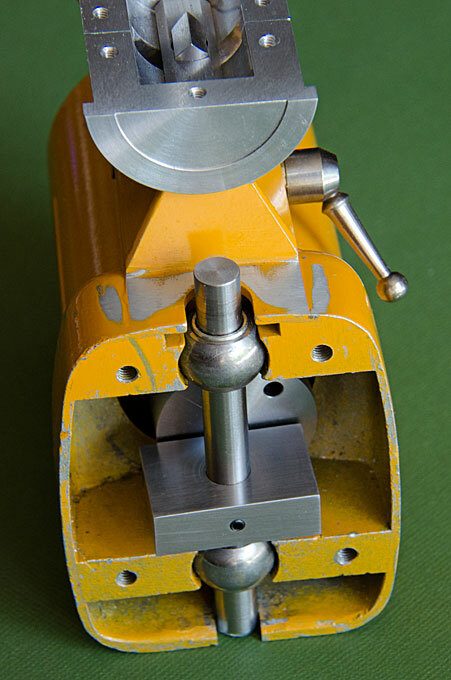 Hand-held filing machines are still in use for work on injection moulds and similar tasks on complex surfaces. 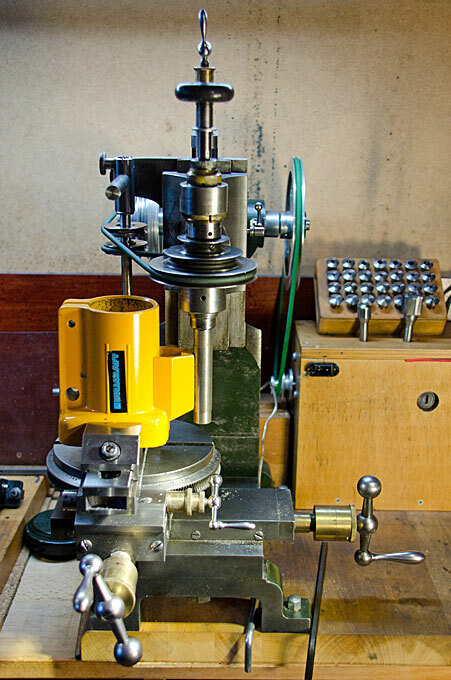 In a small model-engineering workshop, the die-filer still has its uses, mainly to work on precision sheet-metal parts and when one has to ensure that the worked-on surface has a defined angle with respect to another. 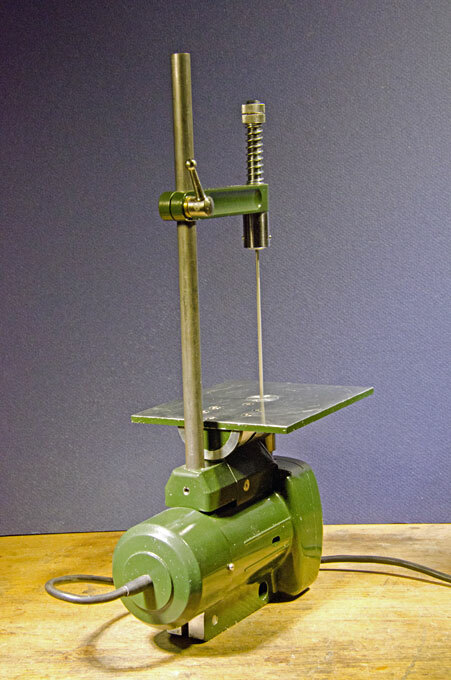 A die-filer can also be used as a scroll saw. 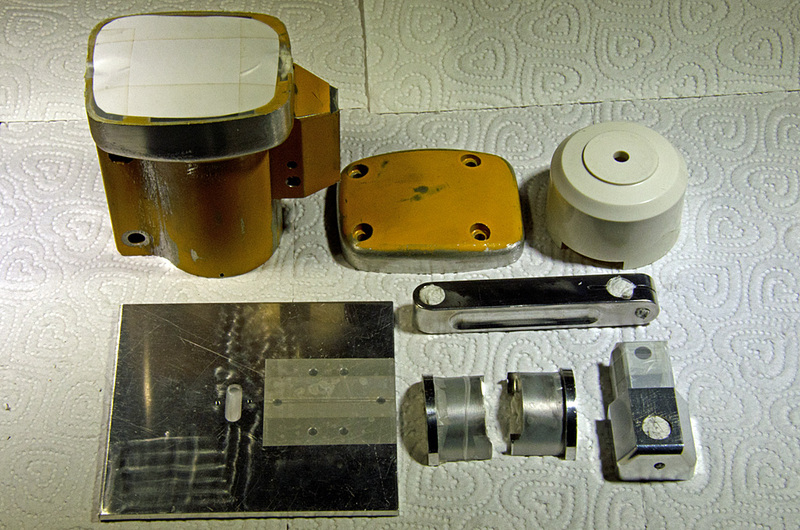 For this reason, castings for constructing a simple die-filer are still being sold commercially and and some small specialised machine maufacturers still produce different machines, mainly for the jewelry manufacturers. However, the latter ones are rather heavy and costly. Some bench-lathe manufacturer also offered filing-attachments that were driven from the lathe headstock. As the filing-machine is useful for clock-making, e.g. for working on the spokes of clock-wheels, some people made their own attachments for WW-type lathes and they are highly priced, when they appear at auctions. Building a filing-machine has been on my agenda for quite some time. With this in mind, I was able to purchase a treasure lot of rare Vallorbe machine-files. 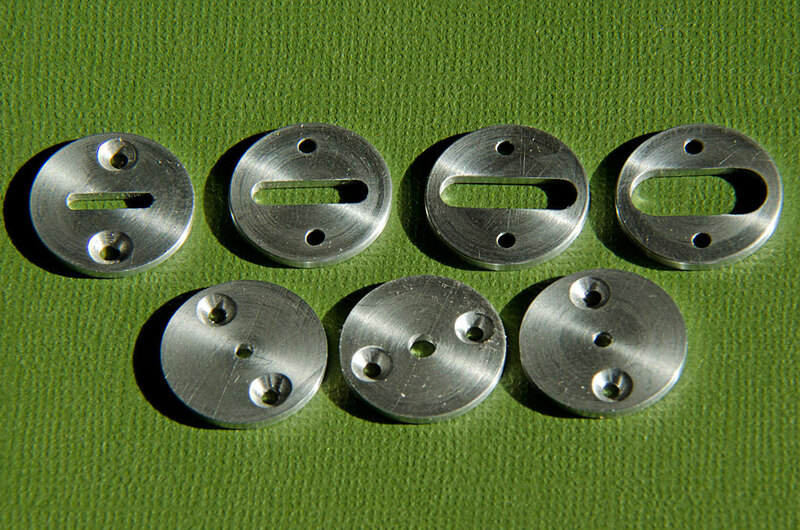 The lot contained round, half-round, tri-angular, and square files starting from 1 mm diamater resp. 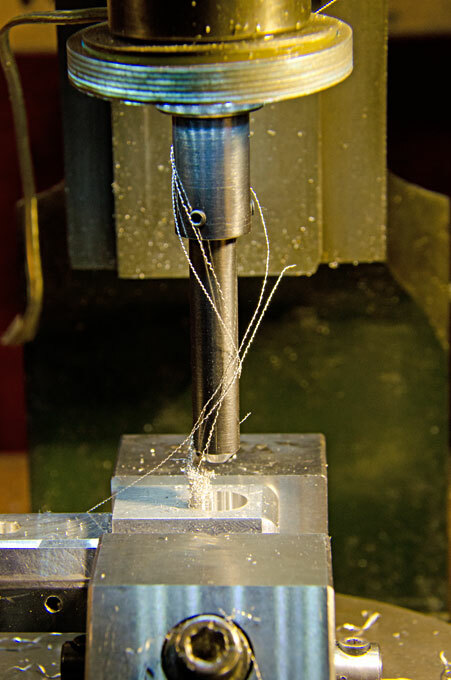 1 mm x 1 mm cross-section, going up to 4 mm x 4 mm, and of various cuts. 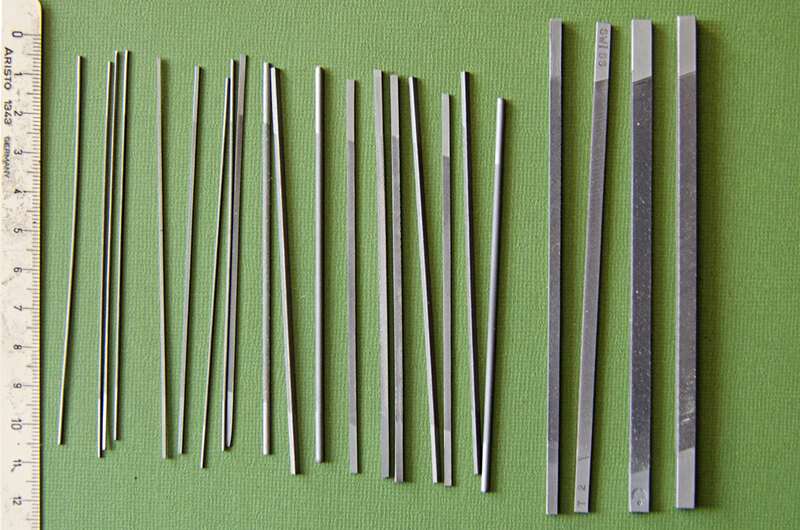 Unlike most other types of files, machines files are prismatic across their whole length and have uncut shanks at both ends. I first thought about converting my only moderately useful Proxxon DS 230/E scroll-saw into a filing machine. However, the table would not tilt and the holders for the saw blade were difficult to adapt. Then a broken jigsaw attachment for a power-drill came into my possession. Having no need for such attachment, the idea of converting it into a filing-machine emerged. The jigsaw was completely stuck nothing moved, and the sole plate was broken off. After having drilled out the screws that held the lid, the reason was obvious: it was completely filled with saw-dust, including the ball-bearing, presumably because it was upside down used under a saw-table. After dismantling and thorough cleaning it worked again. 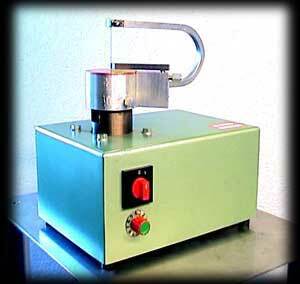 This meant, that I had the mechanism and the casting forming the basis for a filing-machine. 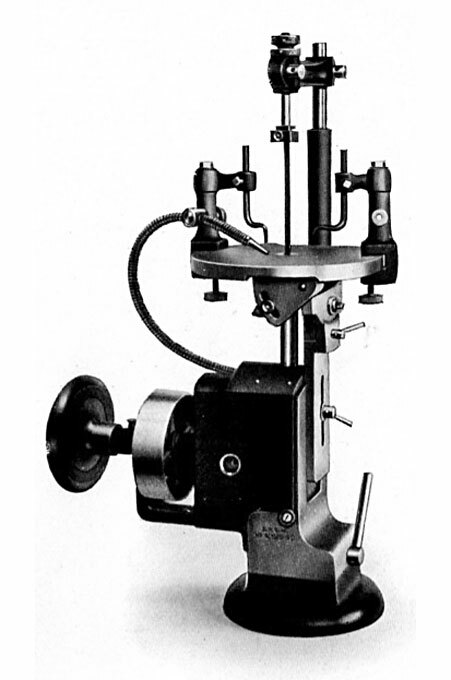 According to the tables in the machine catalogue fo 1913, from which above illustrations were taken, the maximum stroke frequency would be around 400 per minute for hard materials, or less for softer materials. 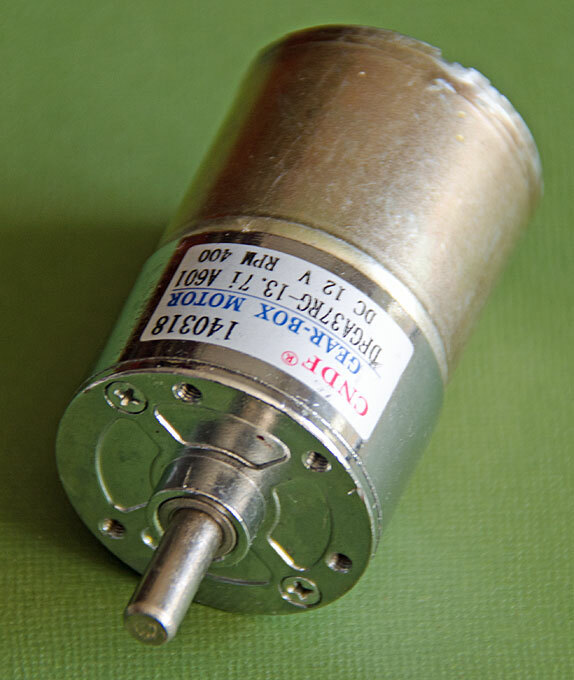 I sourced in China a geared electric DC motor that is rated to have 400 RPM at 12V. The output torque should be sufficient for the machine to be driven directly. 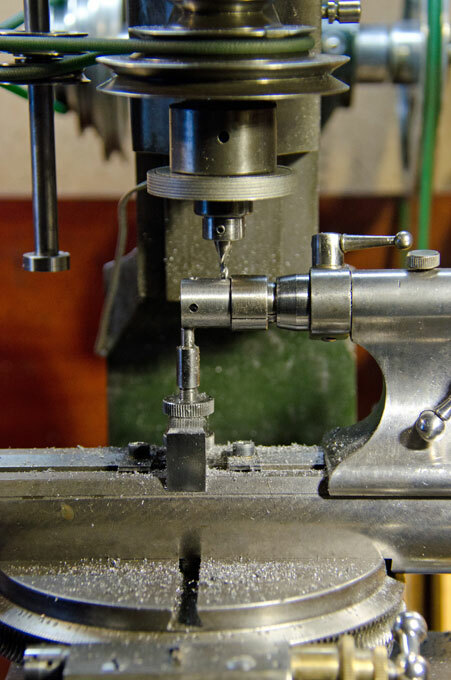 In order to minimise the slot for the files, allowing to work on small pieces, the rotational axis for the tilting machine table should be in its surface plane and it also should not move out of the centre line. The foot of the jigsaw was arranged in a similar way and only needed to be adapted. 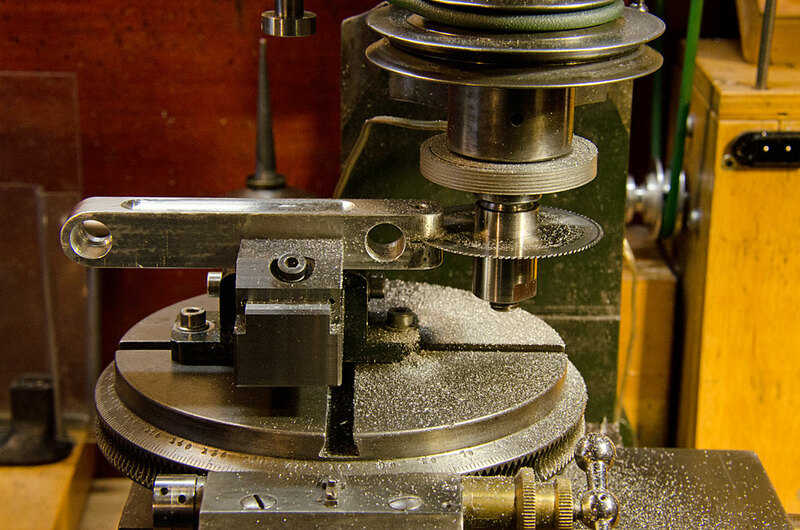 The table will rest on a half-round barrel that can be clamped down onto a corresponding bearing surface. I had some 40 mm diameter alumium in my stock, from which I turned the barrel. It was sawn into half to be screwed to the aluminium machine table. The bearing for the barrel was milled out accordingly. Similarly, some of the future bearing surfaces on the casting were milled flat, which just went up to the capacity of my milling machines. 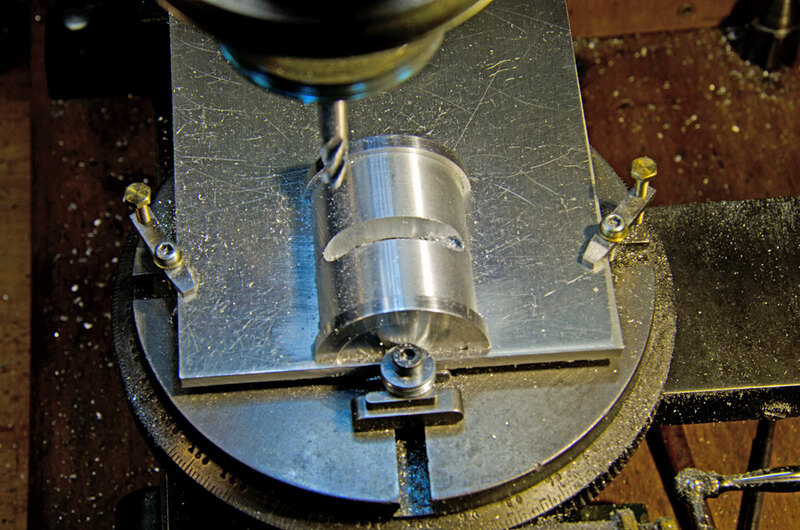 Luckily the zinc die-cast material of the jigsaw housing is easy to mill. 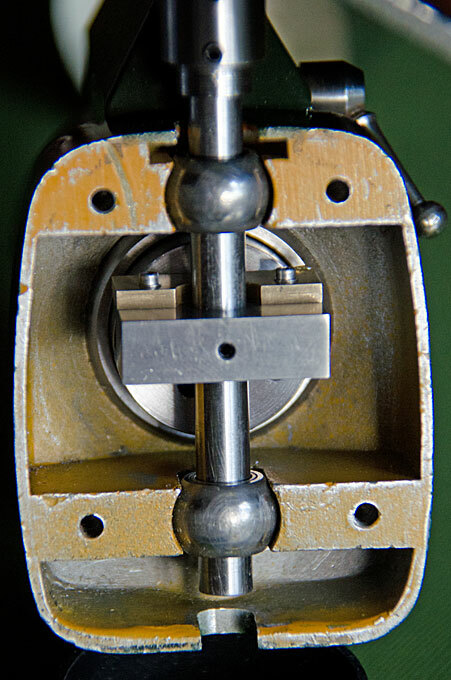 The two halfs of the bearing barrel were clamped end on in the vice after careful alignment. With a fly-cutter the surface was milled perfectly flat and the diameter reduced to bring the rotational axis of the table into its surface. The position for the barrel was marked out on the piece of 4 mm aluminium that will become the table. In the following step the positions for the mounting screws were marked out and drilled mit a 3 mm drill on the drill press. The two half-barrels then were stuck onto the table with a few drops of cyanoacrylate glue after careful alignment. The positions for the mounting screws then were marked with a transfer-punch. A light knock separated the parts again, which were transfered to the mill for drilling and tapping M3 of the mounting holes. 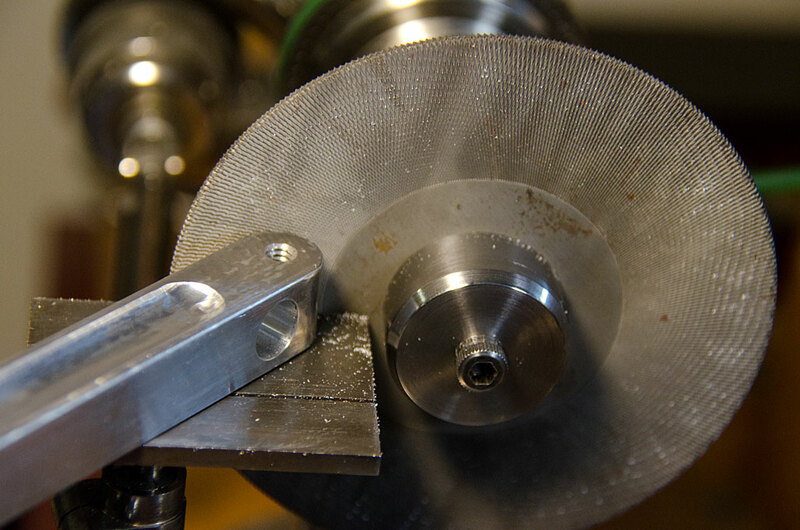 I usually start the tap on the mill with a few turns to ensure it is perfectly concentric to the hole and vertical. The tapping was completed by hand. 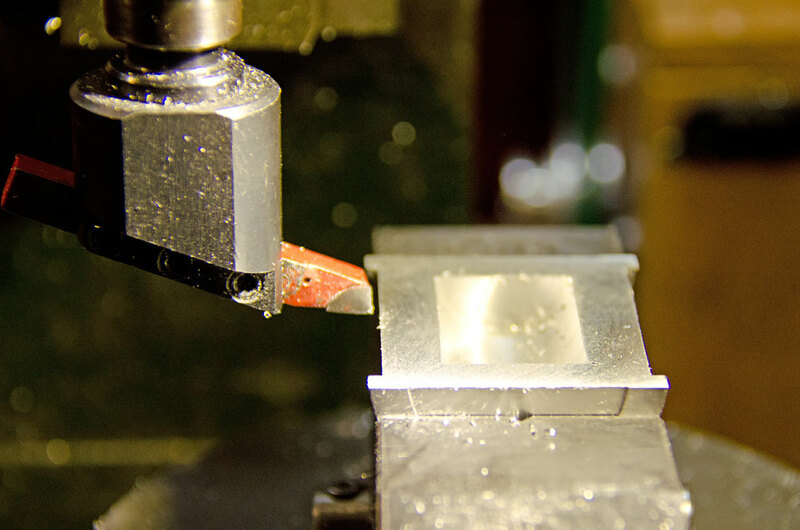 Sqaring the edges of the aluminium plate for the table proved to be just at the edge of the capacity of the milling machine. 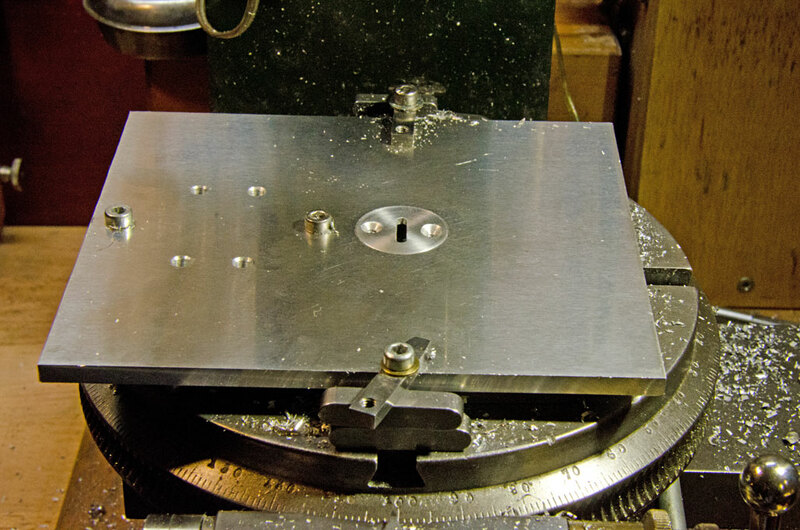 The plate was clamped to the vice on the mill with a C-clamp and the edges milled flat. 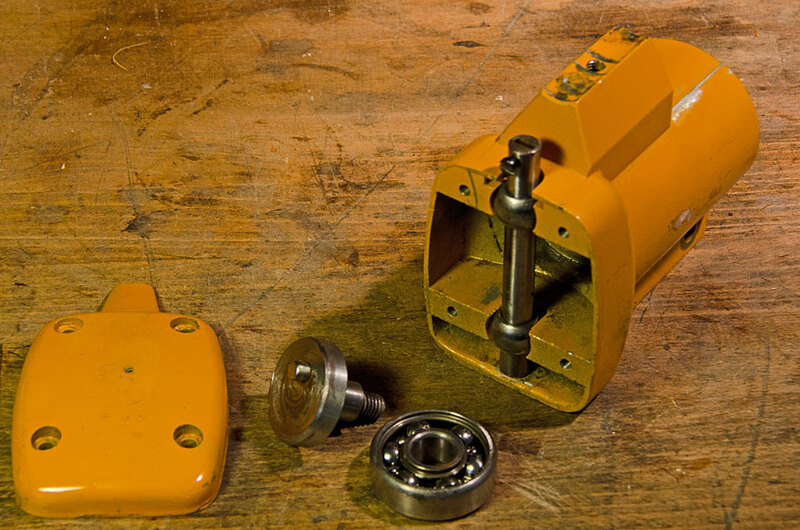 With the bearing-barrel screwed onto the underside of the table, the assembly was bolted to the table of the milling machine for milling the slot for the holding-down bolt. 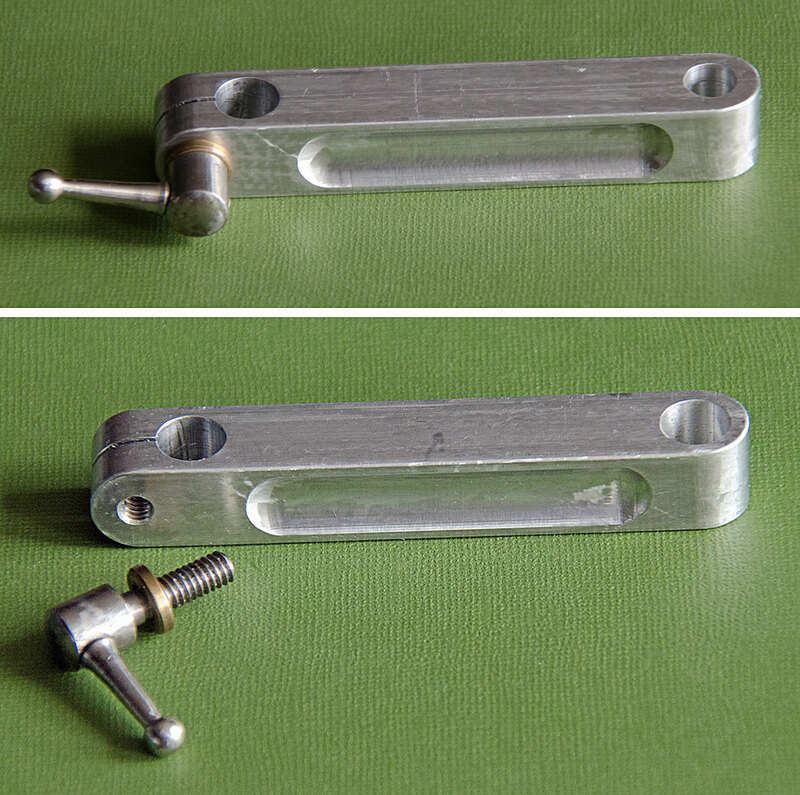 This holding down-bolt is locked using an excentric lever. 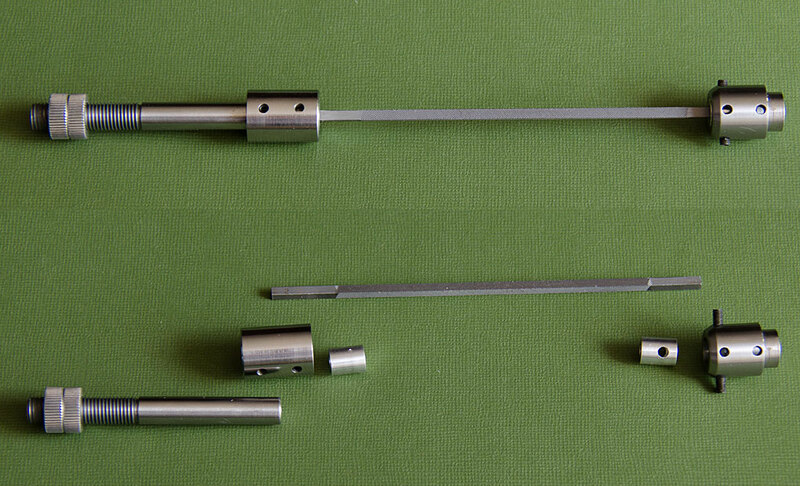 The excentric rod was turned from a piece of steel, while the actual lever with the ball end is a recovered piece from a similar broken commercial product. For other pieces of equipment I turned such levers myself using the ball-turning attachment. The next part to be tackled was the socket for the overam holder. 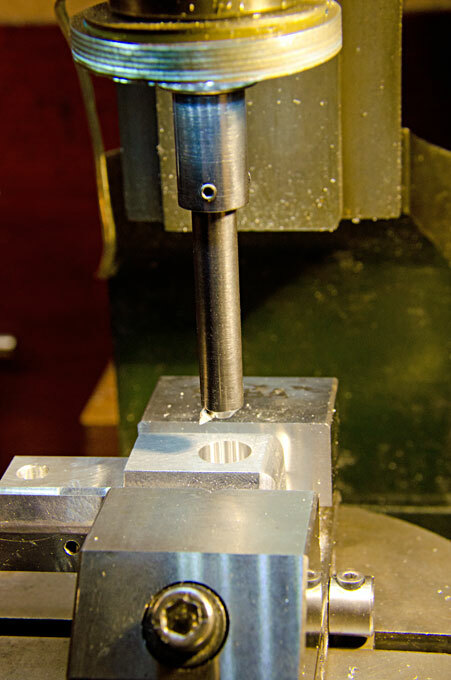 An overam is needed for guiding the delicate machine files and for taking up the side pressure when filing. The foot for the sawing table on the casting was hollow and sort of house-shaped inside. 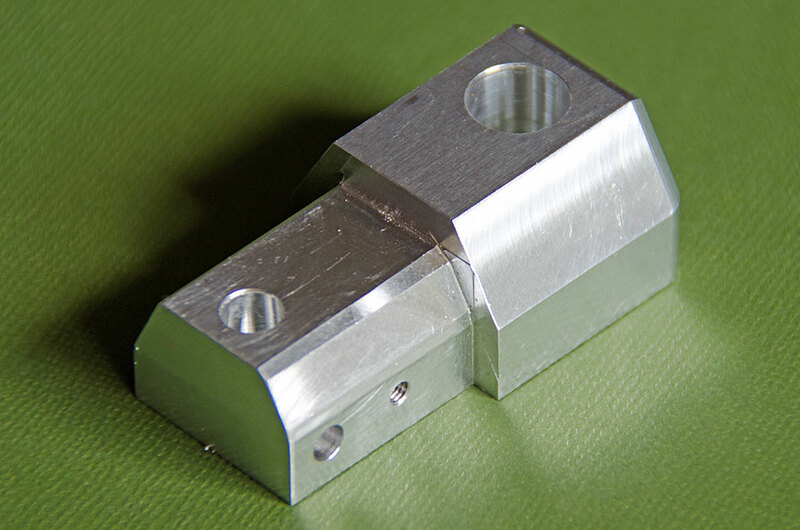 A piece of aluminium bar was carefully milled to shape and size to provide a snug fit. Two tapped holes will locate it in place. 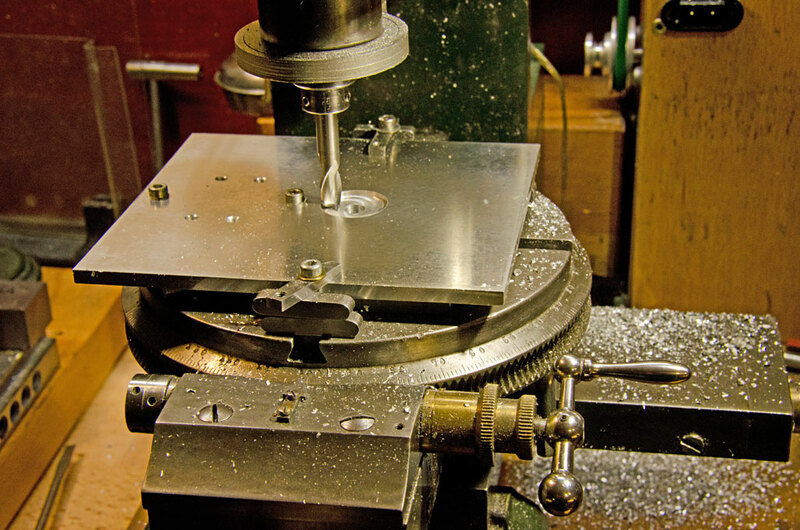 Drilling the 10 mm hole for upright round bar proved to be taxing for the capacity of my machines. There was not enough clearance under the mill for such large-size drill. 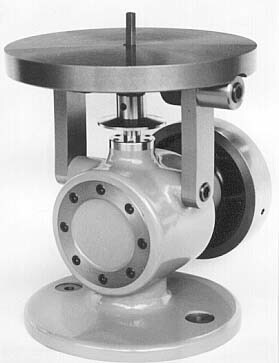 Due to the hole being in one end of the part, it would also not fit into the four-jaw chuck for boring out. 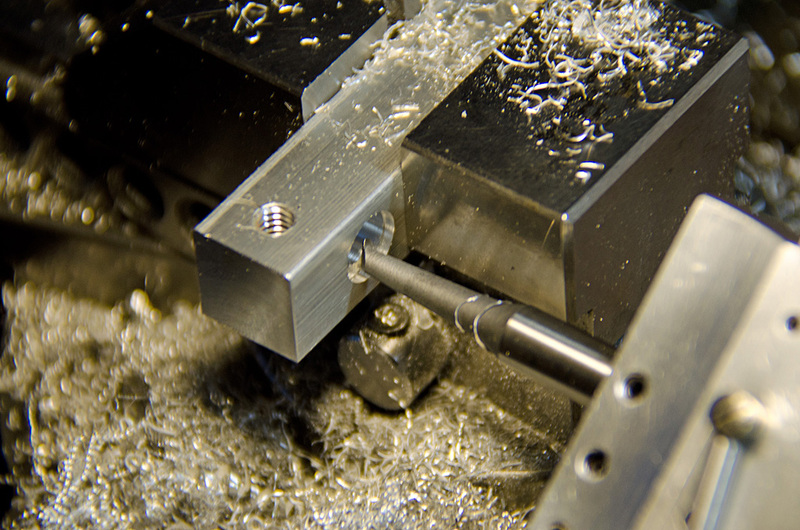 In the end, I realised a long-planned project and made an adjustable boring bar from a piece of 8 mm rod. 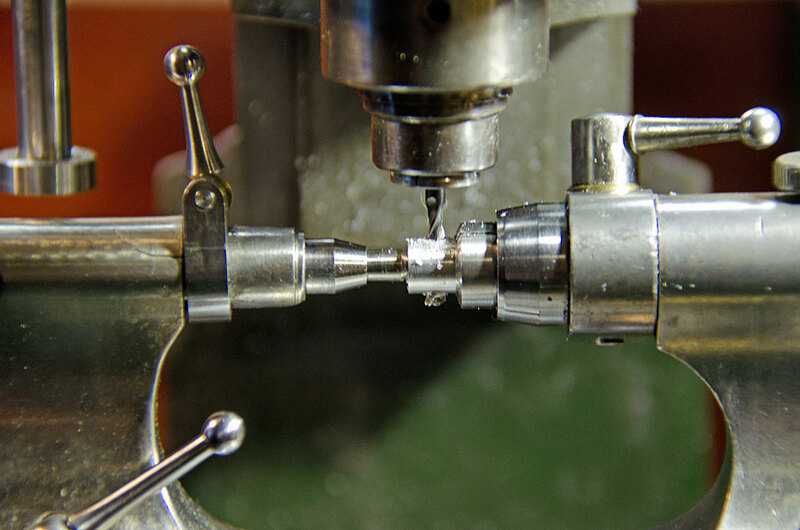 For this I also had to fashion a collet with three set-screws for 8 mm bars etc. With this boring bar it was easy to drill out the hole with an excellent surface finish. 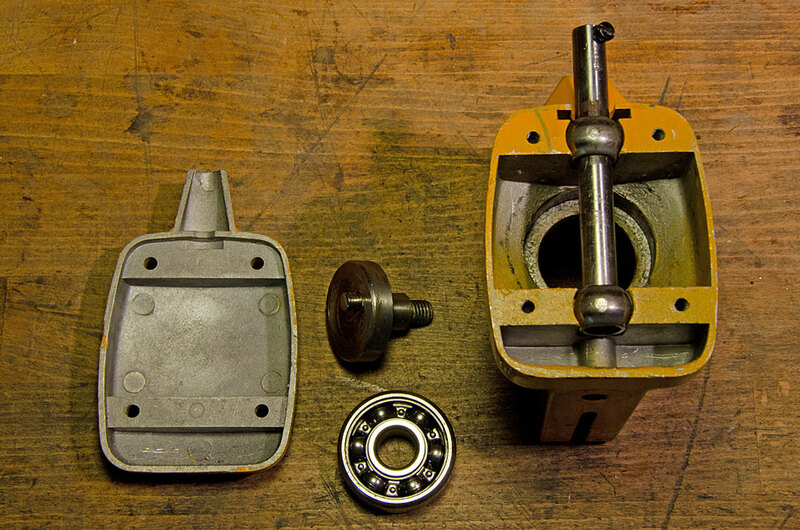 As can be seen on the photograph showing the disassembled jigsaw, the piston for the saw-blade was guided by two self-aligning bearings. These bearings essentially are two cast-iron spheres set into slots and that were bored for the steel piston of 9.5 mm (3/8") diameter. Lubrication relied on the self-lubrication of the graphite in the cast iron and the system had already considerable play in consequence. 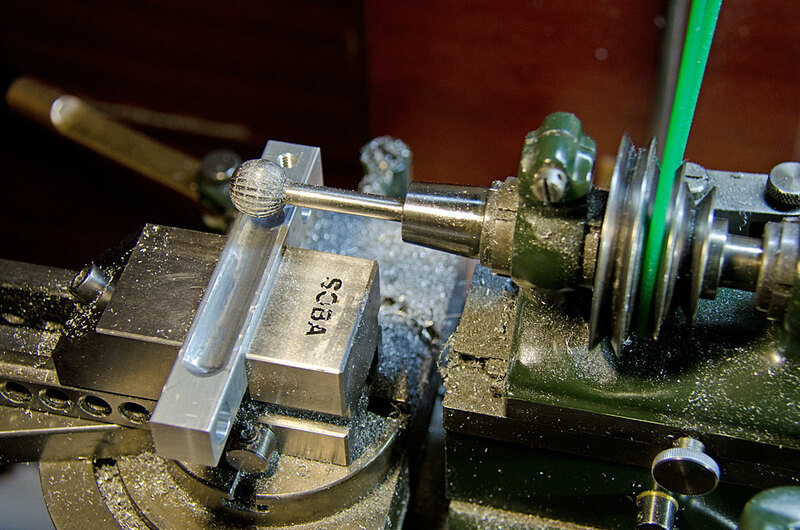 Therefore, the spheres were bored out to accept 10 mm self-lubricating bushings for 8 mm rods. These came from China through a well-known Internet service and are presumably normally used in computer printers and the like. Self-lubriacting bushings were chosen, because oiling would have been difficult under operating conditions. 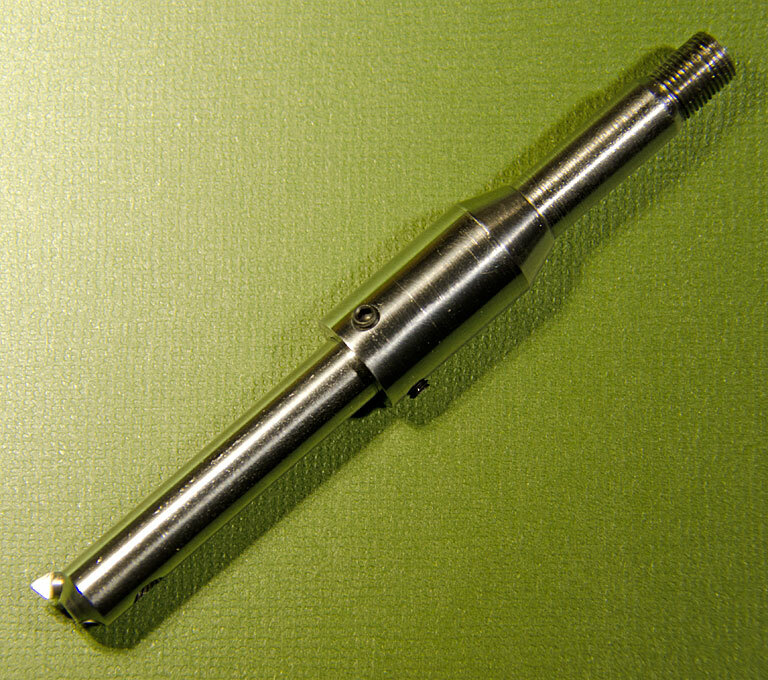 The new piston was fashioned from 8 mm polished and calibrated silver steel. The original drive-shaft was made from a steel of rather poor machineability. 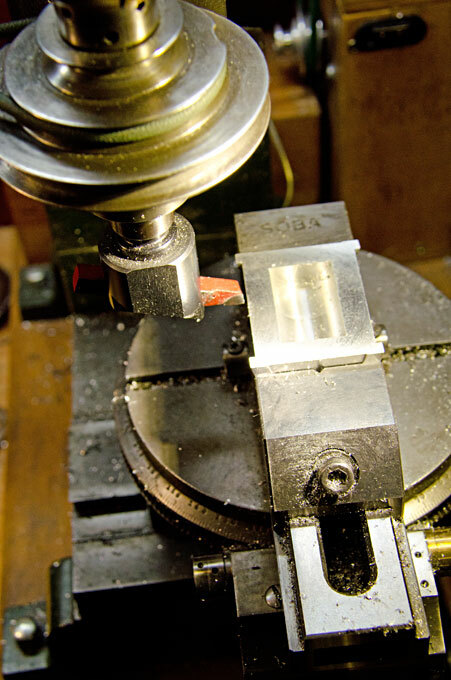 It was impossible to achieve a satisfactory surface finish on it with the watchmaker's lathe. As I intended to change the original design slightly anyway, a new drive-shaft was turned from a piece of 32 mm round steel. 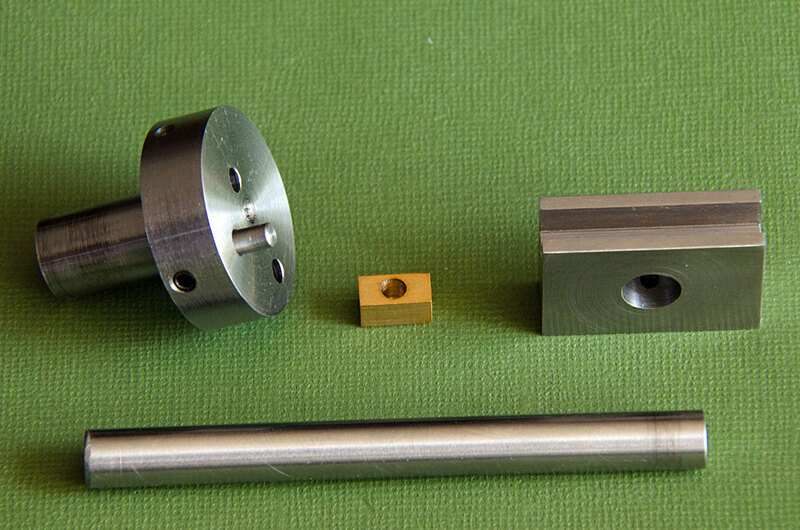 This shaft was bored out for the 6 mm diameter gear-box output shaft to which it will be attached with a set-screw. The whole crank mechanism was also replaced, as it was badly worn due to steel-on-steel sliding friction without any lubrication. Originally a round pin was sliding in the cross-head slot. The new design provides for more positive guidance. A proper cross-head bearing block was machined from brass (bronce would have been better, but I didn't have any in my stock) and will slide in a new cross-head. 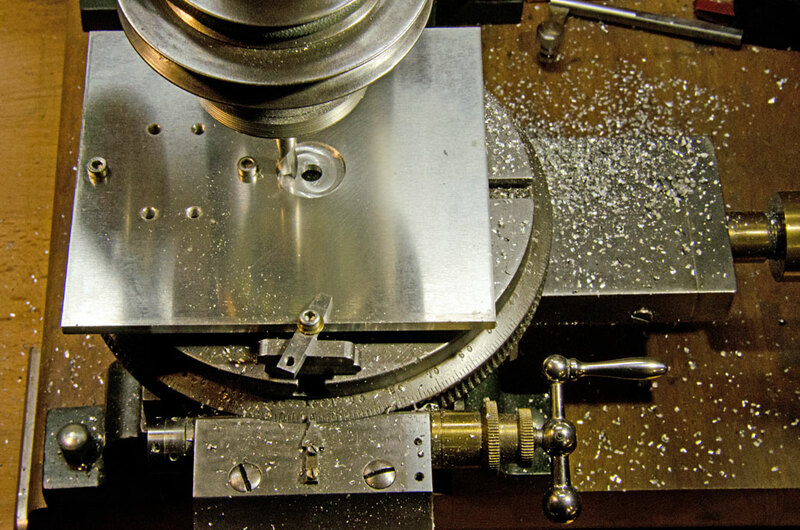 The new crank was bored for the cross-head pin at different distances from the axis, which allows to set the stroke of the machine at 10 mm, 15 mm, and 20 mm. However, it will be necessary to almost dismantle the whole driving mechanism to change the stroke, as the set-screws for the cross-head pin would not be very accessible. The maximum stroke of 20 mm may not be possible with the current file-holder design due to sufficient clearance under the table, when it is inclined. Practical experience will show, whether a 15 mm stroke is satisfactory. 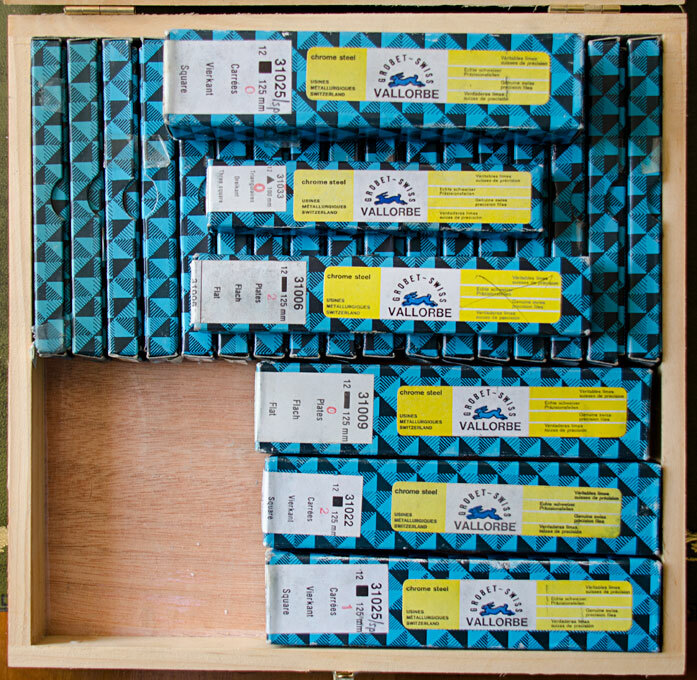 The machine-files come in various shapes and sizes, therefore, various holders to hold them securly and parallel to the axis of movement had to be designed. I opted for sockets into which bushings for the various file sizes will fit. 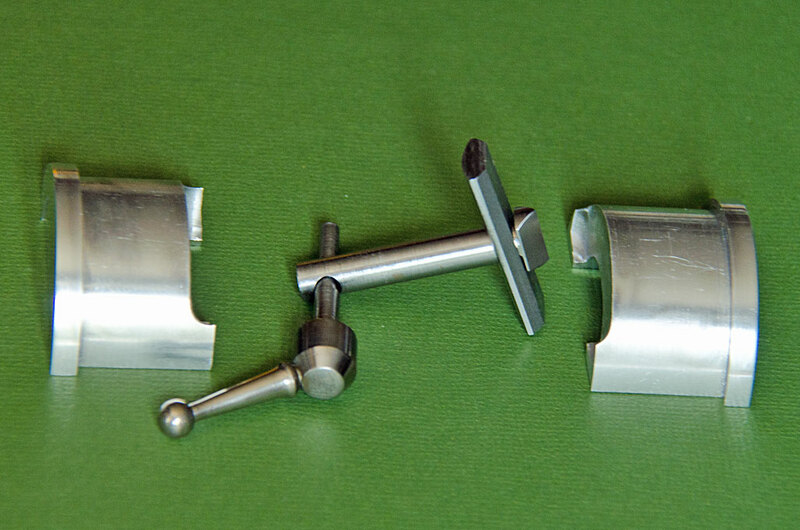 Additional bushing were made to hold fine jewelers saws, so that the machine can also be used as fret-saw. The holders to attach onto the driving piston and the guiding piston in the overam were turned from steel. 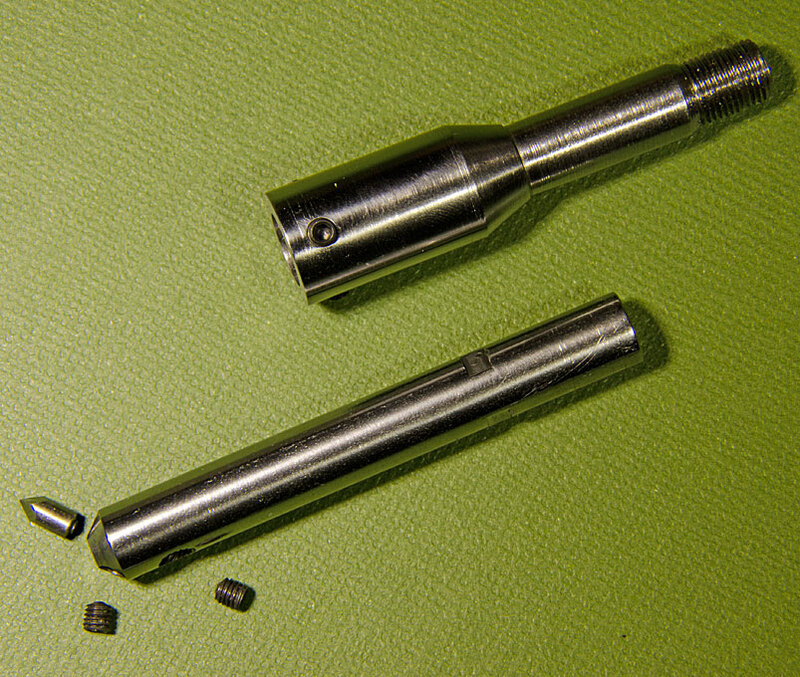 The holders were tapped M3 for two set-screws on opposite sides that will act directly on the files. 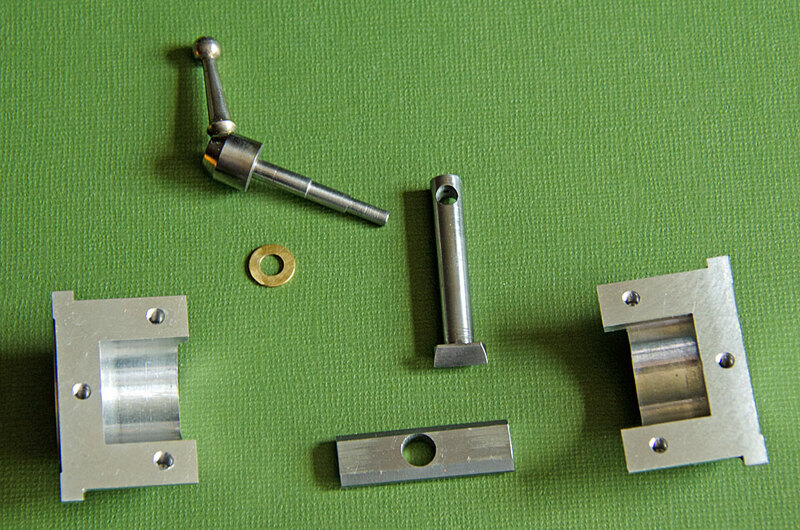 The bushings were turned from aluminium with a selection of internal diameters to fit the available files. They were then cross-drilled to allow the set-screws in the holders to pass through. 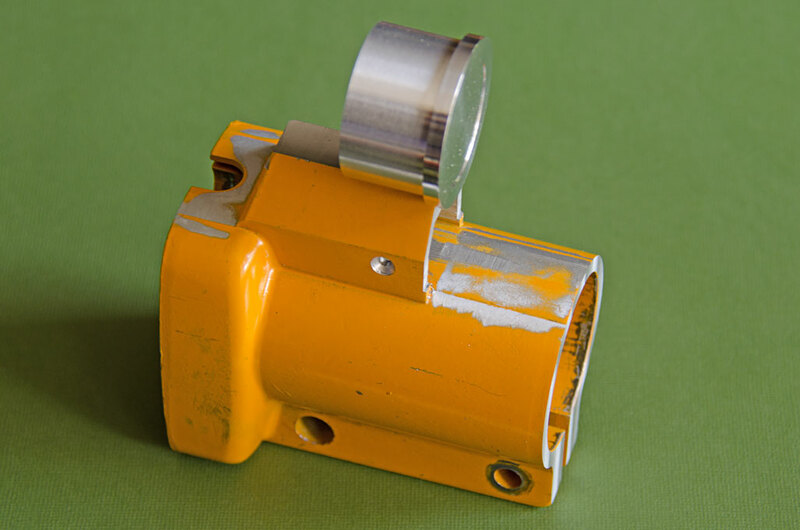 In fact, the holder on the driving piston has two sets of set-screws set 90° apart in order to allow the orientation of triangular and rectangular files as needed. 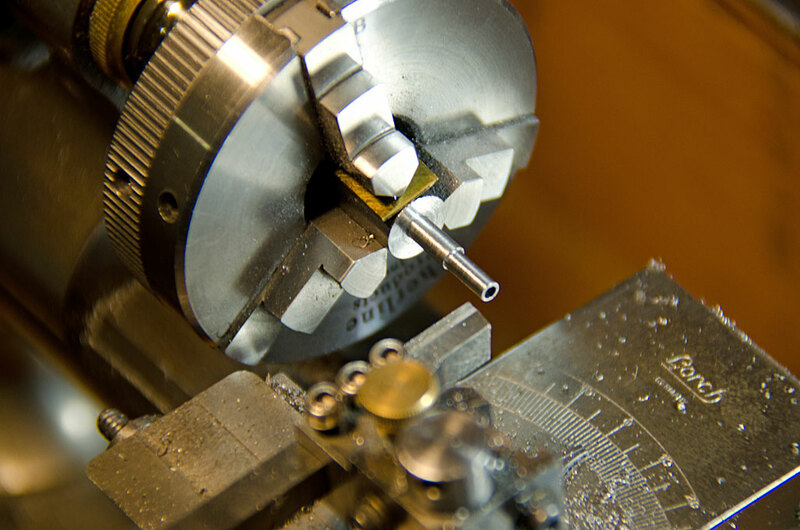 The guiding piston had a 8 mm x 1 mm thread cut on the watchmakers lathe, as I had a suitable tap for this M8 (fine) thread. 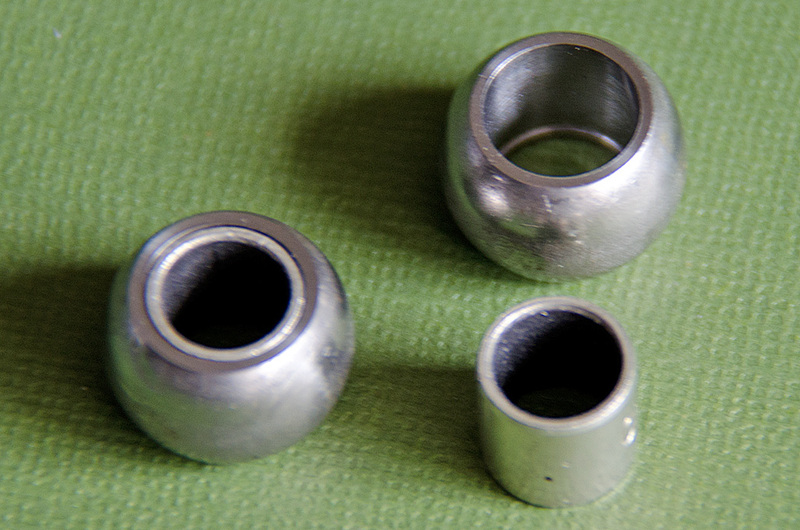 Two thumb-nuts with this thread were machined from aluminium (to keep the mass of the guiding piston low). They give a spring around the piston the necessary intial tension. It is necessary to keep the very thin (1 mm diameter) files under tension in order to prevent them from buckling during the up-stroke. The next item to be tackled was the overarm. 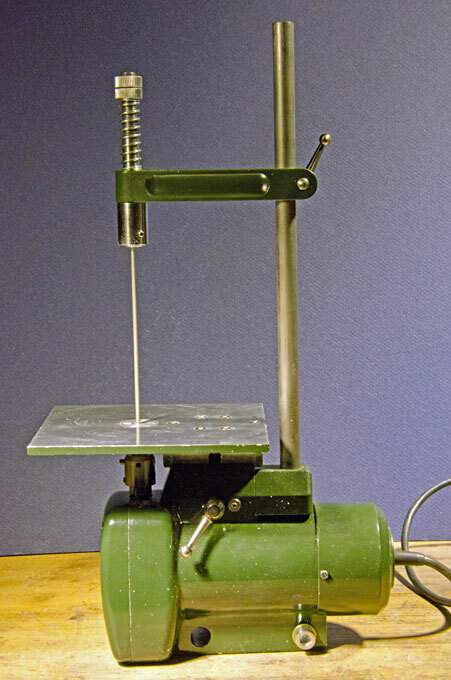 There are three ways in principle to guide the files or saws: 1) the file/saw is tensioned in a frame and this frame is moved up and down as can be seen in most antique machines pictured above; the advantage of a precise movement and a constant tension of the file/saw comes at the expense of a bigger moving mass so that the machine has to fixed securely to a table; if the frame is not designed in a way that it can be removed, the use of stub files and work in internal cut-outs is rather inconvenient, 2) the frame is fixed and a guiding piston moves in a sliding bearing in an over-arm; the file/saw is tensioned by a coil-spring which implies that the tension changes over the movement; the advantages are that the over-arm can be easily swung out of the way, when stub files etc. 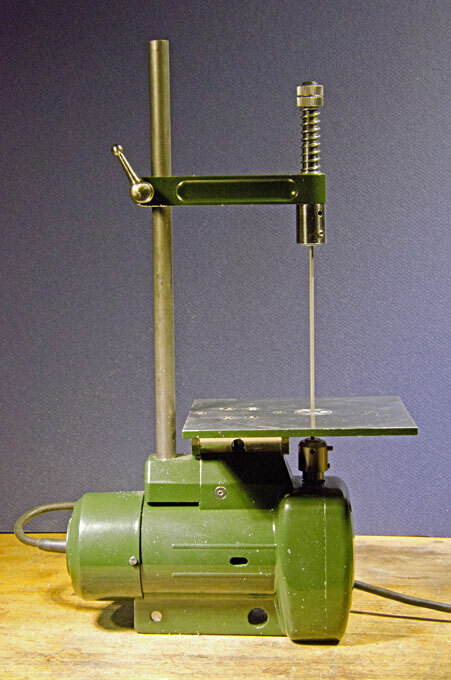 are to be used, or the file/saw has to be threaded into a cut-out; also the moving masses are smaller, 3) the over-arm is actually a leaf-spring, as is the case for many older fret-saws; this design is unsuitable for a filing machine, as the movement is not precisely linear, but has a slight swing, which is actually desirable in a fret-saw. The old jig-saw used only allowed a design according to point (2). 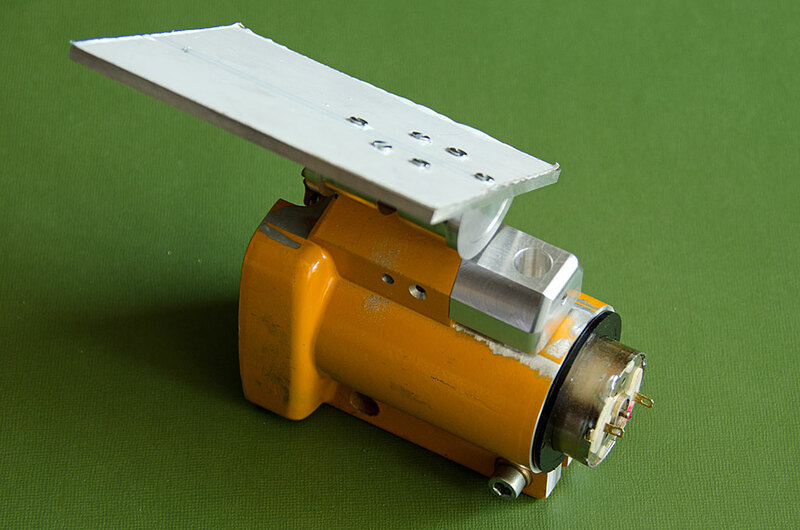 The overarm was fashioned from a square piece of aluminium. 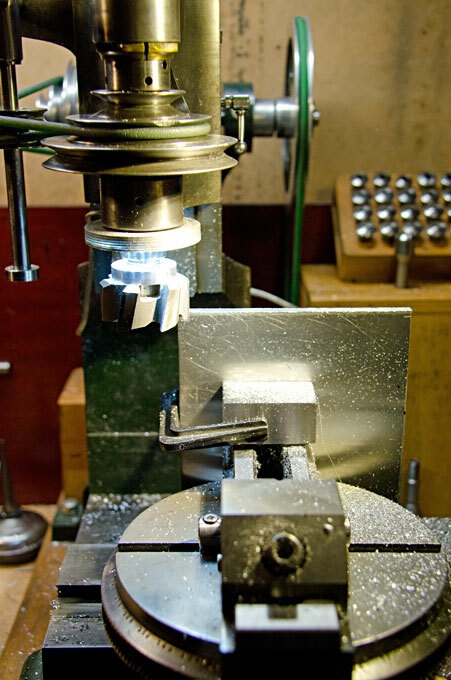 The holes for the self-lubricating piston-bearing and the upright were drilled and bored out to exact dimensions. In order to give it the appearance of a cast part, a relief was milled into the sides of the arm. 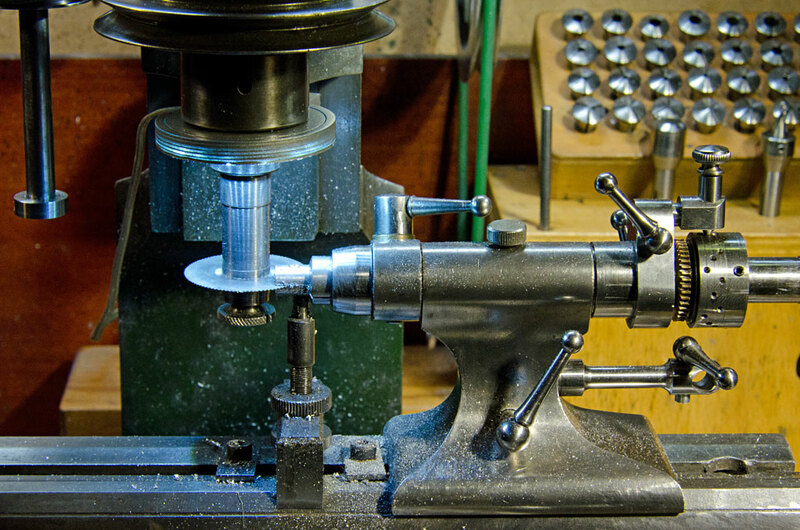 The ends were rounded on a filing disc mounted on an arbor in the lathe (such filing discs seem to extremely rare today, but I was able to acquire one some years ago). The arm was then slotted for the tensioning bolt. 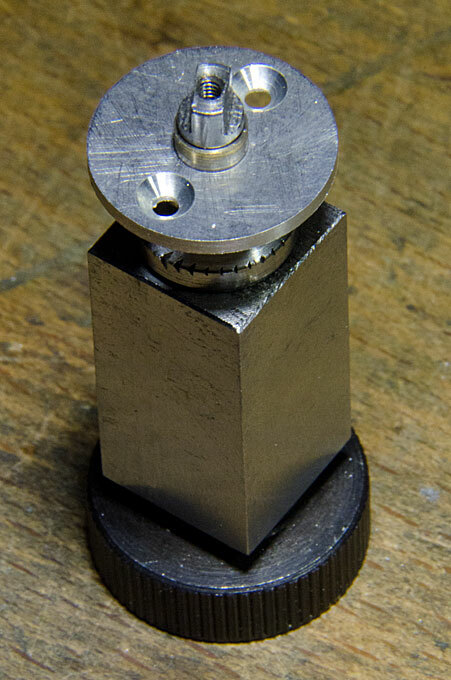 This bolt was found in the scrap-box of old watchmakers lathe parts, but had the unusual thread of 7/32” x 24 tpi. Luckily, I had acquired some years ago a lot of odd taps that contained a matching one. 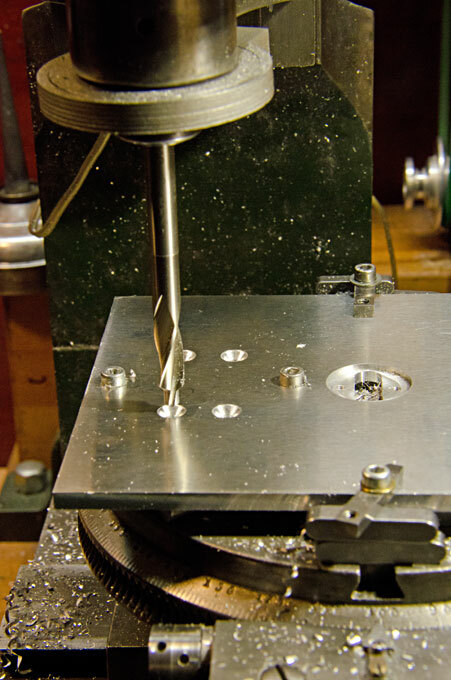 As the filing-machine is designed to work on very small parts, a near-zero clearance around the files is needed. Given the different sizes of files available, the solution is changeable table inserts for the table. 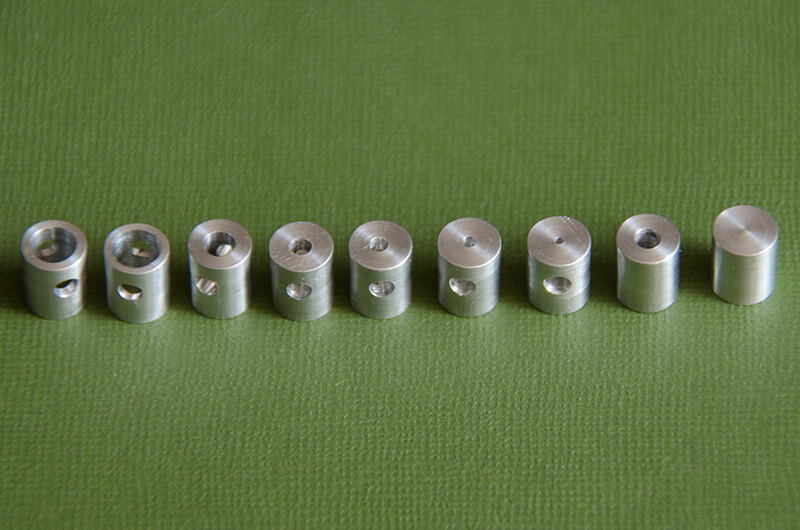 The blanks for these inserts were cut as squares from 2 mm sheet-aluminium. 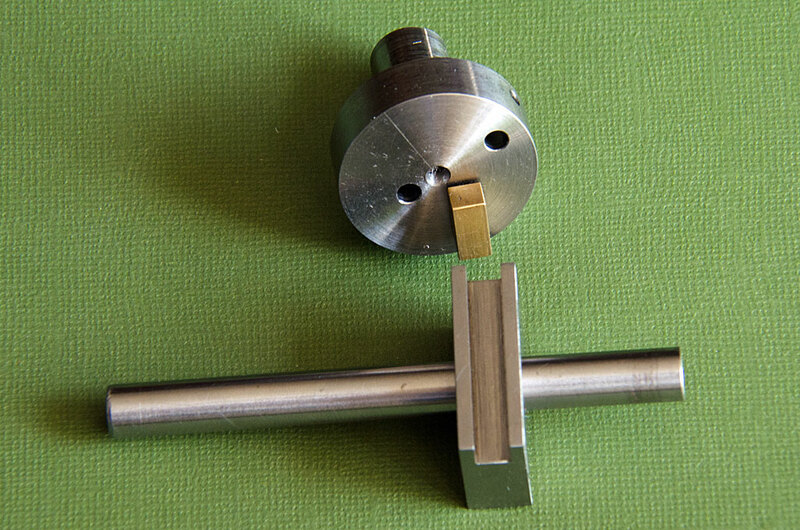 A 2 mm-hole was drilled through the middle of the squares, which then were mounted as a package on a suitable lathe arbor to be turned round. The same arbor was transfered to a square collet-holder. 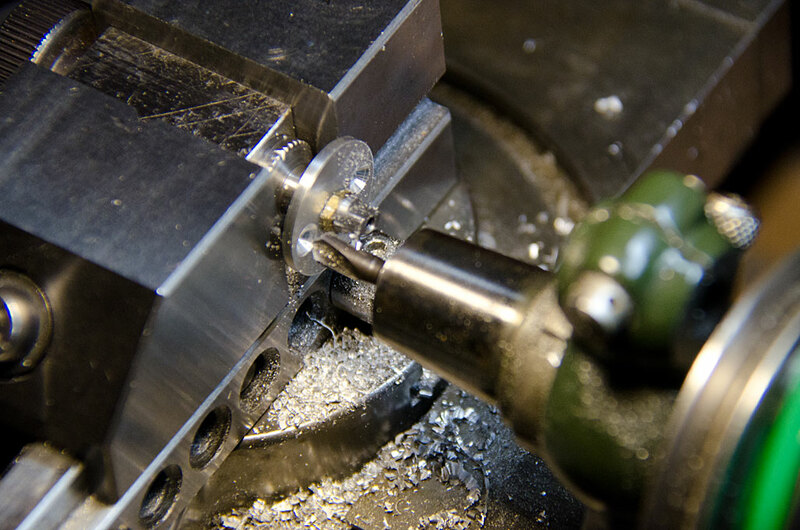 The collet-holder in turn was held in a vice on the horizontal milling machine. 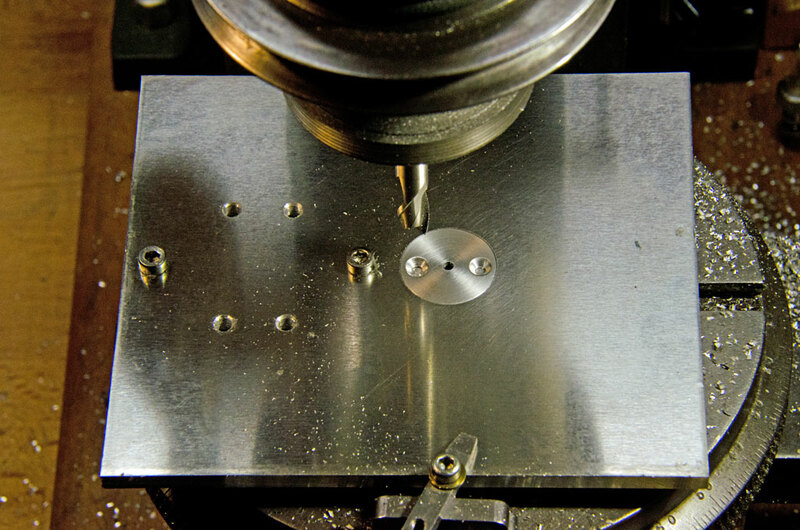 This set-up allow to drill and countersink the two mounting holes symmetrically for two M2 screws. The final piece of machining is finishing off the table blank produced earlier. A recess for the inserts had to be made. Normally, this would be a job for the lathe faceplate, but even with the rising blocks the centre height of my WW Lorch-lathe would have not been sufficient. 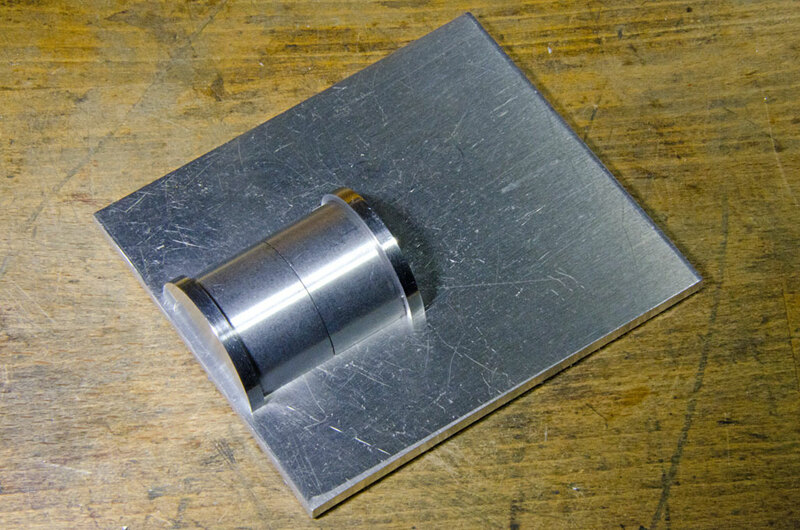 Therefore, I screwed the table blank with spacers onto rotary table of the milling machine, which had been carefully centered before. The marked-out blank was in turn centered on the table. 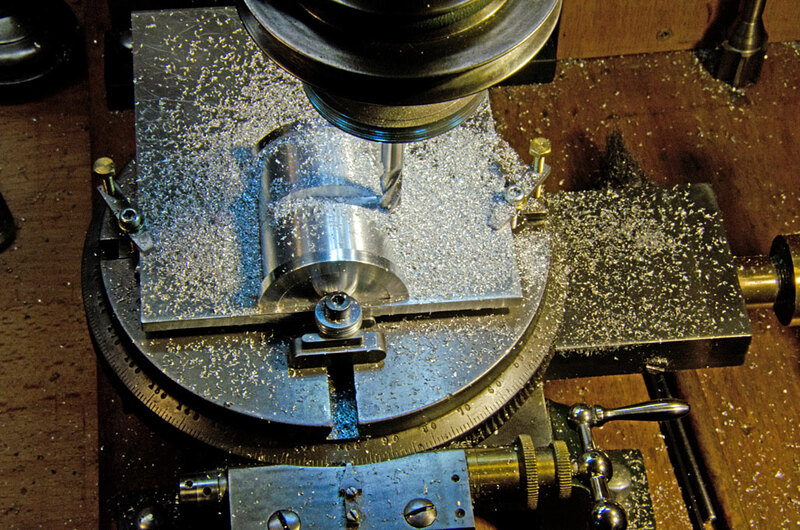 This set-up allowed to round-mill the recess to a depth, where the inserts are flush with the surface of the table. In the same set-up the clerance slot for the files was milled out to allow the inclination of the table to 45° in both directions. Using an insert as template, the mounting holes for them were drilled in the same set-up. This allowed to screw-down the inserts in their place and to mill the clearance-slots in them in situ, thus avoiding alignment errors. Again, in the same set-up the holes for the table-bearing barrel were countersunk, which had not been done before, because the table surface was kept protected by its plastic film. 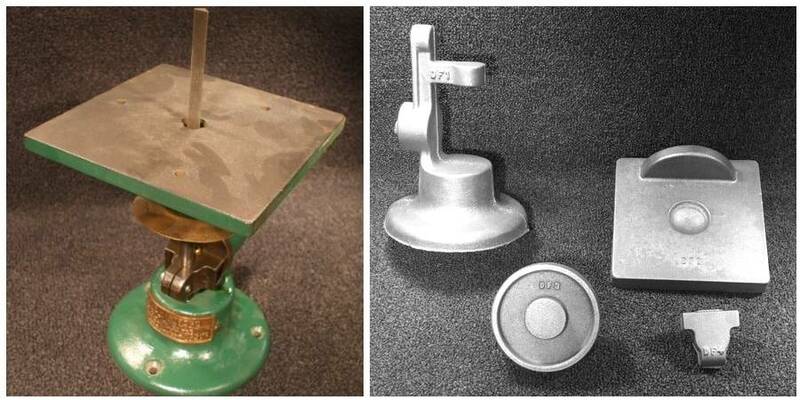 With all the machining completed, the various castings were cleaned up for their cosmetic appearance and lightly sanded to provide a better key for the new paint. The areas not be painted were masked with tape and and any openings stuffed with toilet paper. 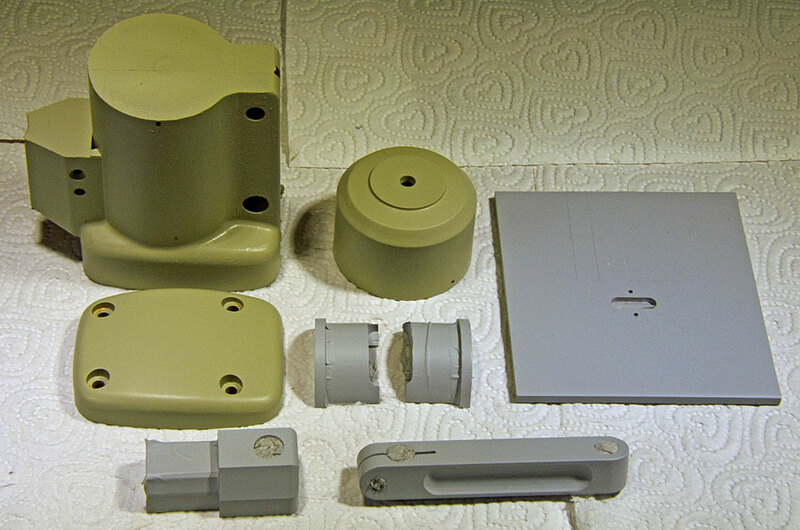 The castings were given a light coat with a filling primer, while the fabricated parts were just given a coat in an ordinary primer. 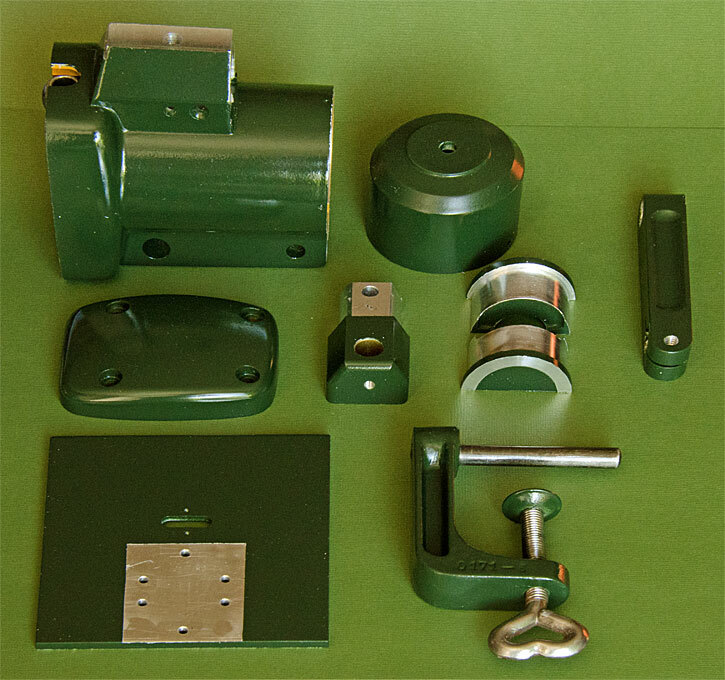 After some light sanding and thorough de-dusting the parts were spray-painted in my favourite colour for machines, in RAL 6007 'Bottle Green'. I find the combination of bright steel, polished brass details, and the dark green aesthetically very pleasing. On the images above there are two parts visible that have not been discussed yet: a round cap that will close-off the electrical installations of the motor and a clamp to fix the machine at the workbench. The round cap actually is a bakelite cover for some electrical home installations and which had almost the right internal diameter. I just needed to enlarge it on the lathe by a few tenth of milimetres. It is held by two M1.6 cheese-head screws for which the casting was drilled and tapped. The clamp belonged to an obsolote electrical drill. The reciprocal movement of the filing machine will necessitate some form of fixation, or it is likely to jump around a bit. 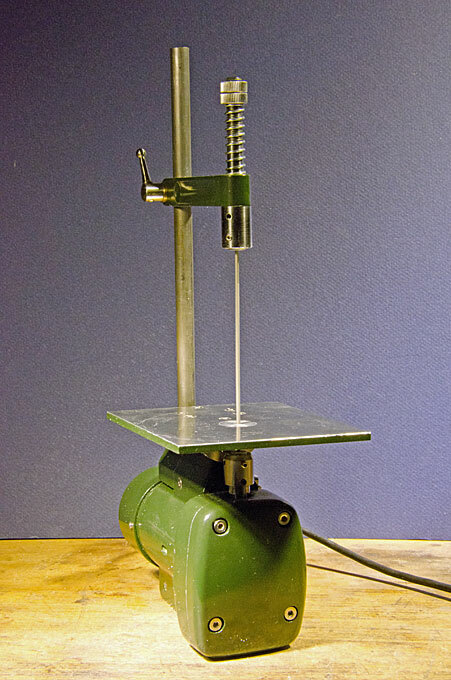 In addition, the high centre of gravity of the machine would make working with it like this rather unstable. It was now time to assemble the various parts. The ballbearing was thoroughly greased and pushed back into its seat. Next the drive shaft was pushed in and the crank and piston assembled. Holding the motor concentric in the casting initially caused a bit of headscratching, but then I chanced in the scrap-box upon a set of plastic reduction rings from a machine (they may have well belonged to the very jig-saw) and one of them had just the right internal diameter to fit the electric motor. 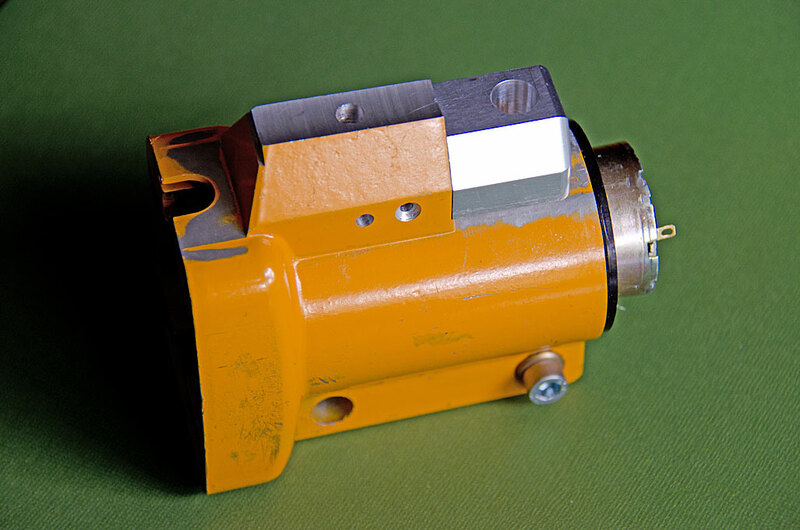 The drive-shaft was secured with a set-screw to the gearbox output shaft. 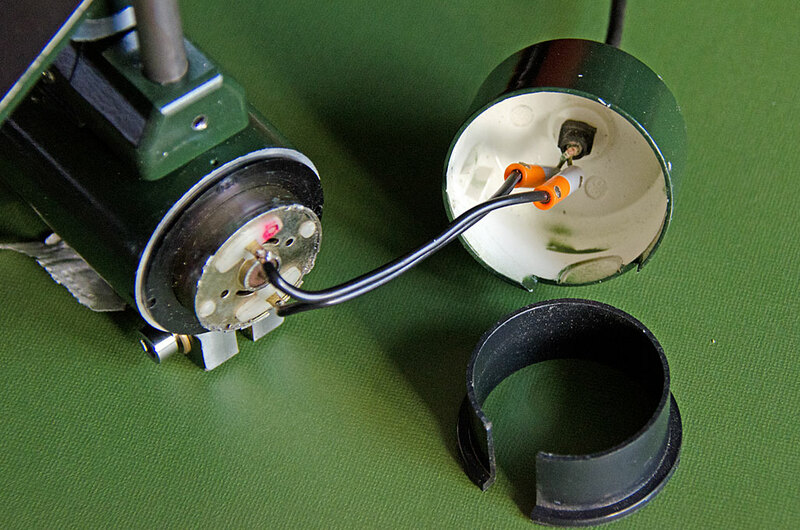 The scrap-box furnished also a rubberised cable complete with kink protector, for which the bakelite cap had been drilled out. When the assembly was complete, the machine was ready for a first test-run. 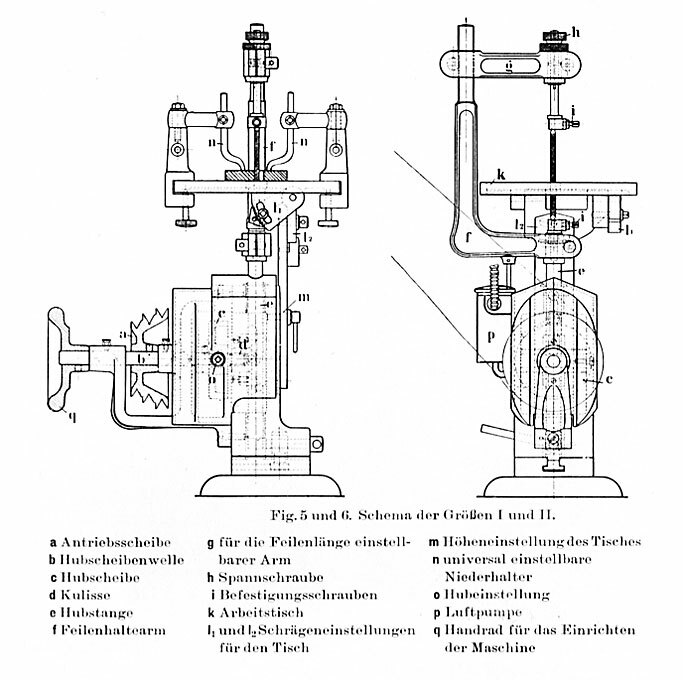 During the test-run I noticed something previously overlooked: the piston did not have a firm guide to prevent it from rotating. 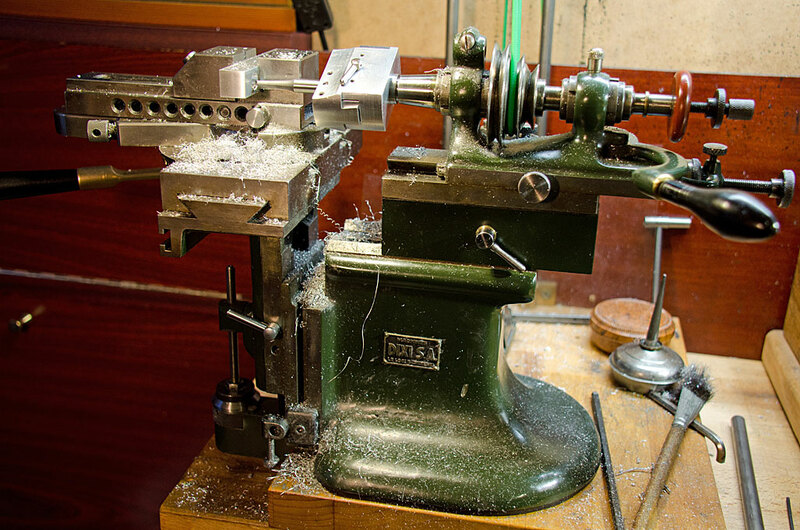 It was thought that the crank would give enough guidance, but it still wiggled somewhat during each stroke, which is rather undesirable for precision work. 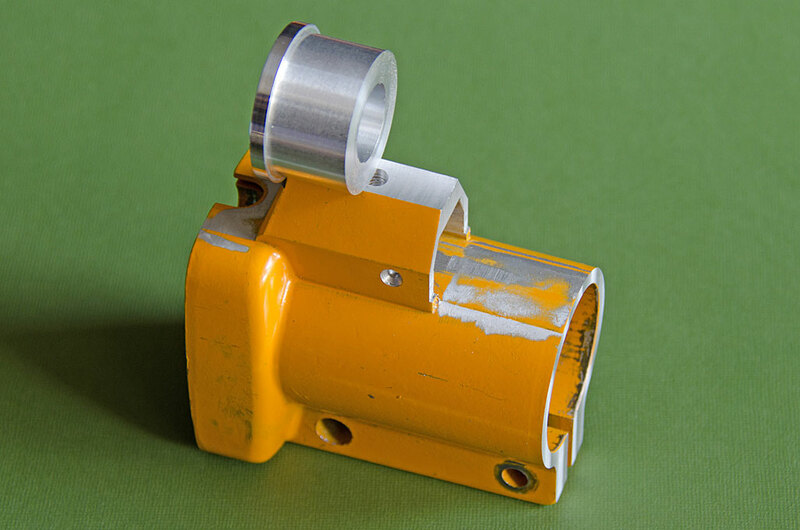 Therefore, a brass guiding plate was added to the cross-head that slides along the crank-plate of the drive shaft and thus prevents the piston from rotating. One could have also made a new crosshead that touches the crank-plate, but I wanted to avoid a steel on steel contact and the guiding plate can be adjusted for wear. 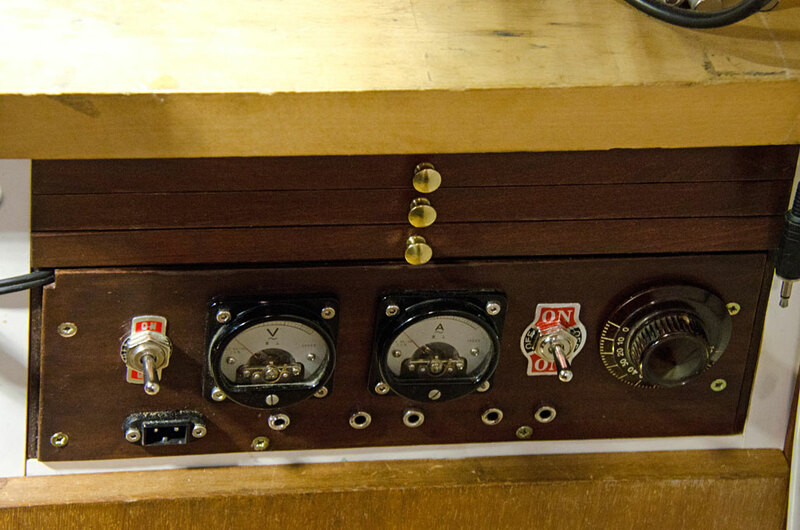 Testing the diefiler in anger requires a suitable power supply with enough ampères and the right voltage. 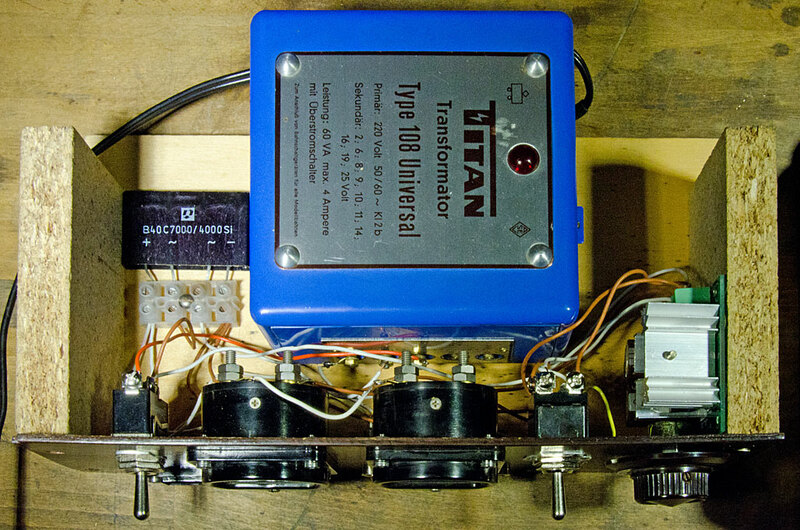 After my large Proxxon transformer blew out I constructed from mainly scavanged parts a unit that would fit into the worktable. From the estate of my late father I had a large transformer, a rectifier, and a nice 'antique' volt- and ampère-meter each plus various kinds of sockets and a radio knob. I bought an electronic speed-controller and two switches from Chinese sources. One switch allows to change between the two voltage ranges and the other is set up as a reversing switch. Depending on the size of leads I am either using small Japanese-type power-supply plugs or 3.5 mm mono-plugs and sockets for both are provided. In addition, I provided sockets for 4 mm laboratory plugs, one going through the speed-controller, the other directly to the rectifier.